July 2 – 30, 2011. L2kontemporary proudly presents Excess, the second solo exhibition at the gallery from Serbian-based artist Dragana B. Stevanovic. The exhibition opens July 2, 2011 and closes July 30. In her paintings from the series Excess, Dragana B. Stevanovic successfully blends the subjects that used to occupy her with idea of the flow of consciousness as the main narration in paintings and she introduces the play of letters and words into a dialogue with represented personages. 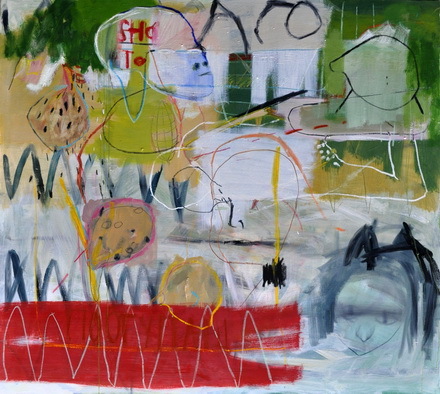 Known by her expressive, colorful palette, Stevanovic paints the motions and events she is currently preoccupied with. This is why her paintings do not show any central motif – sometimes, drawing is predominant, or dark hues, gender themes; sometimes everything seems to be in disorder and disharmony. The result of such principle is the representation of “excess”, that is, a combination of figures, portraits or skulls with formal aspects of canvas attacked by fireworks of colors. Placing the letters and words in the composition, Dragana defines the canvas as flat surface, the place at which her ideas combine in various ways. This interweaving of personages, their ambiences, words, letters, contrasts and colors on two-dimensional canvas is the basic characteristic of Stevanovic’s new paintings. The impact on the beholder is instantaneous, and the canvases seem visceral. Only after a period of time the figures and their correlations can be recognized in the paintings. There is no point of support, no center of the composition. In relation to beholder, Dragana B. Stevanovic treats the canvas as background for communication, as a point of confrontation of the beholder’s own thoughts and points of view regarding the relations formed within the painting itself. The enigma of the letters and their meanings in the paintings add to her skillful breaking of the modernist narrations about the flow of time, about unity and centrality of the gaze, as well as about figure as the main actor in works of art. In such way, Stevanovic forms new narration, which follows the flow of consciousness of the artist during long periods of time that she dedicates to each painting; thus ideas and motifs complement each other and intertwine. This is why her paintings approximate portrait of the chaotic era we live in, where media create events, information multiplies but is getting forgotten even more and more quickly.